No Angles to Cut! EZ Framer Instant Storage Shed Framing Kit's unique galvanized steel angles and base plates make erecting a building fast and easy! Perfect for constructing a storage shed, tool shed, or mini-barn. 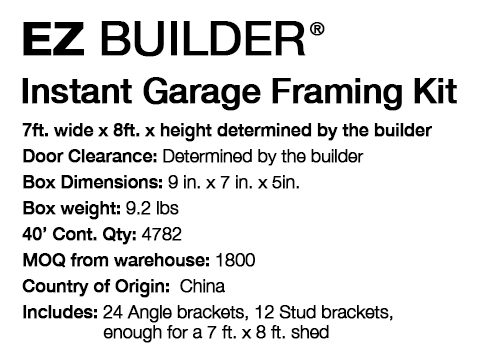 Order TWO framing kits for an 8 ft.W x 14 ft.L building. Order THREE kits for a 10 ft.W x 22 ft.L building. Lumber and roofing materials not included. 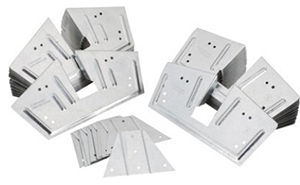 Pre-angled brackets are specially designed to attach to standard 2x4's, eliminating the need for special mitered cuts or precise angle measurements. The brackets do the work for you, giving you the perfect angle every time! 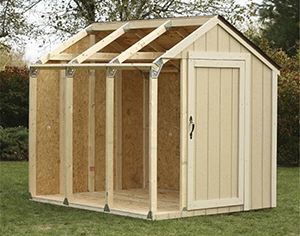 One kit contains enough brackets to build a 7'x8' shed with a gabled roof. The height is up to you, as well as placement of windows and style and size of the door.